A woman who cannot feel afraid because of damage to part of her brain could help scientists discover treatments for post-traumatic stress disorder (PTSD). Research published in Current Biology showed the woman felt no fear in a variety of scary situations. 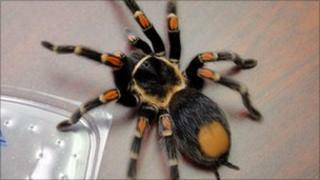 These included exposure to snakes and spiders, horror films and a "haunted house". The woman feels other emotions but said as an adult, she had never felt afraid. She is the first known case of someone who is unable to process fear. Researchers at the University of Iowa said her inability to feel frightened was because she has damage to a structure in her brain called the amygdala. The structure has long been associated with emotional learning - experiments in animals have shown that removing it makes them fearless. However, it has never been observed in a human before. The woman experienced fear as a child and knows that some situations should be frightening. As an adult she has been in various frightening situations, including being threatened with a knife and held at gunpoint. These did not make her afraid. Researchers at the University of Iowa, in Iowa City, observed and recorded the woman's responses in situations that would make most people feel fear. She watched a series of horror films, went to a reputedly haunted house and to an exotic pet store - where she handled dangerous snakes and asked to handle a tarantula. She showed no fear in any of the situations and had to be prevented from touching the tarantula because of the high risk of being bitten. When asked why she wanted to touch something that she knows is dangerous, she replied that she was overcome with curiosity. Lead researcher Justin Feinstein said: "Because she is missing her amygdala, she is also missing the ability to detect and avoid danger in the world. "It is quite remarkable that she is still alive." Adam Perkins, a postdoctoral researcher at the Institute of Psychiatry, King's College London who specialises in researching the causal basis of anxiety and fear looked at the research. He said the study was interesting because it suggested the amygdala is the neural seat of fear - and specifically responsible for generating feelings of fear, rather than emotions in general. The researchers hope that by studying the woman they can understand how the brain processes fear. This could be useful in treating patients suffering from PTSD - such as soldiers who have been serving in conflict areas. Mr Feinstein added: "Their lives are marred by fear and they are often-times unable to even leave their home due to the ever-present feeling of danger." By studying the woman, researchers hope to create treatments that selectively target the brain areas that can sometimes allow fear to take over.